Mrs. Kingscote was one of the first female novelists to attend Oxford University. This novel is about a couple who agree to divorce so that he can marry a rich woman and support the couples four children. 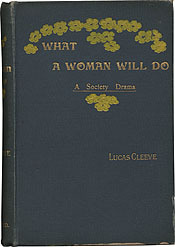 Lucas Cleeve [pseudonym of Mrs. Adelina Kingscote]. What a Woman Will Do. London, F.V. White, 1900.